STAFF SGT. GARFIELD AMBROSE, son of Mr. and Mrs. M. G. Ambrose, Jefferson, has been transferred from Camp Pickett, Va., where he had been stationed since June, to Officers Candidate School at Grinnell, Iowa. He recently spent a tenday furlough at the home of his parents. 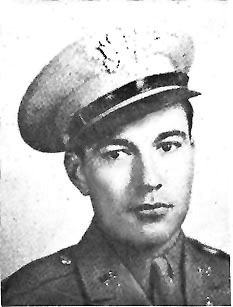 Captain Garfield Ambrose, son of Mr. and Mrs. McCarthy G. Ambrose, of near Broad Run, was killed last night in an automobile accident in St. Louis, the Associated Press reported today. The dispatch said the accident occurred when a broken steering mechanism caused Capt. Ambrose to lose control of his automobile and the machine struck a viaduct pier. The Army officer was hurled out of the car and thrown 20 feet by the impact, sustaining fatal injuries. Word of Capt. Ambrose's death was received this morning by his parents, who reside a mile from Broad Run, it was learned. The countian was attached to the Army recruiting office at St. Louis. Capt. Ambrose had been in the Army for more than two and a half years, being employed in Washington prior to that time. He was stationed at Camp Pickett, Va., and later attended Officers Candidate School at Grinnell, Ia. It could not be learned how long he had been stationed in St. Louis. Capt. Ambrose was born and reared in Brunswick, where his family lived for some time before moving to a farm near Broad Run. His father is a passenger conductor on the Baltimore and Ohio. There is also a brother, Jesse. No funeral arrangements had been announced today.